The most important thing necessary to begin modifying a Subaru WRX is the car itself. The first model year for the WRX was 2002, and now that they have been out for a few years, it isn’t that difficult to find a clean car for under $15,000. 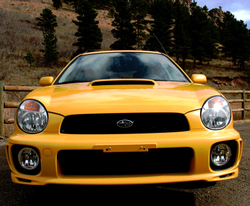 So this first installment of our project car will be all about what to look for in a used WRX. The first thing to do is to figure out how much you want to spend, and see what cars are available in your price range. Then go and look at a couple of cars, and see what you think. Sometimes it is worth spending a little more money to know that you are getting a car that was well taken care of. When you are looking at a WRX, there are a few things to look for. First, look at the top of the radiator, and see if there is any green powdery residue. 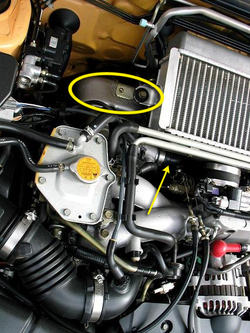 If there is, this is a sign that the radiator is leaking where the aluminum clamps the plastic top to the radiator, and it will most likely need to be replaced. Also, the doors and fenders are made of aluminum and light gauge steel to reduce weight, but that also means that it is really easy to get dents. Look at the doors, and particularly the front fenders above the wheel to see if there are any dents. If you can find a car with few or no dents, it is a good sign that it was well taken care of. Now, if you are planning on modifying the car, there is a saying… “The cheapest way to build a project car is to buy someone else’s”. If you find a car that has been modified all ready, you can almost always get the car for much less than what it would cost you to buy a stock car, and modify it yourself, but you have to be careful that you don’t buy someone else’s problems. If you decide to go this rout, it would be a very good idea to take the car to a dealership, or shop that specialized in modifying Subaru’s, and have then give it a once over before considering buying the car. You will want to make sure that the mechanic performs a leak-down test to make sure that the engine is still in good shape, and not the victim of bad tuning. You will also want to have the transmission checked to make sure that it is still in good shape too. These are the two key areas to consider when looking at a used WRX. For our purposes, we want to start from scratch, and build the car on our own. Another thing that you have to be aware of when buying a used sports car, such as the WRX is that some people will “De-Tune” the car before selling it. This means that you could end up with a car that has been modified, and driven within an inch of its life, then parted out and returned to stock so you don’t even get the advantage of the car coming with an assortment of aftermarket parts. There are a couple of things to look for in the engine bay that can give you an idea as to whether the WRX that you are looking at has been modified. First, look at the heat shield that covers part of the turbo. It is down and to the left of the intercooler. If it has been cut at all, or if there are only a couple of bolts left holding it on, there is a good chance that the car has at least had an aftermarket exhaust on it. The stock heat shield is too small to fit over any aftermarket down pipe, so it is usually cut, or left off all together. There are also a lot of tiny bolts that hold it in place to keep it from rattling, which are hard to put back on, so they are often left off when putting the car back together. Next is the intercooler hose. Look just below the intercooler, and you should see a black plastic hose connected to the turbo. This plastic hose is very difficult to put back on the turbo once removed, and is basically a one time use piece. The intercooler must be removed for many basic modifications, so the first thing people will often do is to replace this plastic hose with one made of silicone. If you see a silicone hose, perhaps with Perrin, or Samco on it, again, there is a good chance that the car has been tinkered with. The last thing to look for is something that isn’t easy to see. If you look under the crank-case on the passenger side, you can catch a glimpse of the up-pipe. This is not a very easy part to install, and it is really no fun to try to put the stock up-pipe back in after you put an aftermarket up-pipe in, so the stock part is rarely put back on the car. If you don’t see any heat shielding on the up-pipe at all (it looks just like a plain piece of pipe), or If there is an exposed flex joint, the car that you are looking at has an aftermarket up-pipe. Once you have found a car that passes all these criteria, it is time to take it for a spin. See how the car feels. If the car comes with an OEM boost gauge, you should be hitting about .8 bar of boost. Also, pay attention to how the transmission feels. You should have no trouble shifting up the gears, and no trouble shifting down, except into first. I have only seen one WRX transmission that liked downshifting into first, even if you match rpm’s. You are looking to make sure that the syncros are still doing their job, which is a good measure of the condition of the transmission. I should also mention that it is normal to have some difficulty shifting into reverse. It is a straight cut gear, so sometimes it is a little difficult to get it to engage. If you are having trouble, put the shifter in first, let the clutch out a little, then push the clutch back to the floor and try reverse again. This will usually work. Another thing to pay attention to on your test-drive is the clutch. There is a reasonable amount of slip in these cars, but if it doesn’t feel like the clutch is fully engaged until the very end of the pedal travel, it could indicate that the clutch is wearing out. Also, if you take the car out on the highway, look for slippage in fifth gear when going up hill. Once you have found a car that is in good shape, and drives well, see if the owner has service records. A car with all the scheduled service done in a timely manor is ideal, and you will usually have to pay a little more for it, but it is worth every penny. Lastly, it is still a good idea to take the car to a mechanic and have them give it a once over. A trained Subaru mechanic may see something you didn’t, and it is no fun to buy a car, only to find out that it needs major work. If it passes this test, there is nothing left to do but buy it. We went looking, and were able to find a 2003 Yellow WRX wagon that was in very good shape, with no previous signs of tuning. A leak down test told us that the engine was still in very good shape, even though it has more than 60,000 miles on the clock, but the clutch felt a little soft. It may be on its way out, but since we will most likely be replacing it soon, that isn’t really an issue for us. Good luck in your search for a WRX, and don’t be afraid to keep looking until you find a car that is just what you are looking for. If you all ready have a WRX, and are looking for tips on getting the most performance our of your car, stay tuned. We will start the quest for more power, better brakes, and a balanced suspension in Part 2. Very nice writeup. Nice work. I was trying to think of some other important areas without getting to picky, considering the car will be tuned, and I couldn't think of anything else. Your writeup is very thorough. I look forward to reading more about your tuning project. Nice write-up. Wish I would have seen this prior to buying my Yellow '03 WRX sedan. Would have been nice to know all these things to look for up front. You should mention watching out for after market intakes, BOVs, and manual boost controllers. All pretty easy to spot and potential trouble makers. Cool! Guess i've finally hit jackpot in looking for complete shop's journal of tuning and setting up a wrx! Nicely written. After a modifying all cars looks good.I also modified my BMW car. This is so cool. I drive a Chevy but I do have a stock Mitsubishi Eclipse that I really want to modify into something like the one in Fast and The Furious. I know I'm gonna spend a lot of money on it, and I hope I have the time (and funding) for the project. The Eclipse already has a fast engine, it's just will just take a little tweaking to make it faster. I'm impressed with the resources that gave espcially those downloadable applications. It 'rare to encounter a blog thats so helpful and educational, and let me tell you, you hit the nail on the head. This post is excellent, this is something that many people do not speak intelligently. I like the idea of how you select your car. The same by goes for me: it's rather quality than quantity. I really enjoyed reading this project car, Subaru, on how you worked on it. I am inspired to do the same to my own. I had gotten the present of our mom for the Christmas time considering she was one jewelry freak. The actual one thing she cannot don a great deal of is actually, bracelets. I purchased this girl this particular allure bracelet to anytime she opened they yesterday she absolutley loved that it! Nowadays the problem is actually, the lady obtaining information technology in additionally off by just herself. Haha... overall ideal goods, they transported additionally came completely early then the mom was enjoying they. Thank your. My personal boy gave me personally that of mothers day. He understands im maybe not up to price tag however exactly what comes from your center. I can't trust it has my favourite shade and also truly meets my personal wrist. I by no means could uncover bracelets to fit headphonesmy small wrist. Very pleased to come with recieved that as a gifts.